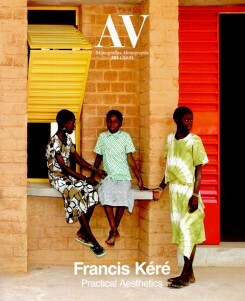 Issue 201 of AV Monographs is devoted to Francis Kéré, the Burkina Faso architect who moved to Germany and has become an emblem of social and sustainable construction. From his office in Berlin, Kéré returns time and again to his native Gando to help transform his community, creatively reinterpreting the limited resources and working with the local population. The magazine covers his career with a selection of twenty works and projects – from the School in Gando, for which he received the Aga Khan Award in 2001, to the Volksbühne Satellite Theater in Berlin – and five installations – from the Sensing Spaces Pavilion in 2013 at the Royal Academy of Arts in London to the Serpentine Gallery in the same city, built in the summer of 2017.